Pocho Aztlan is the band's first release since Brujerizmo was released in 2000 via Roadrunner. It was recorded over the course of many years and at several studios around the globe. The end result was mixed by Russ Russell (NAPALM DEATH, THE EXPLOITED). BRUJERIA's legend has proliferated for nearly three decades. When the band first emerged from the sunbaked hellscape of Los Angeles in 1989, the city was on the brink of chaos. Daryl Gates ruled the LAPD with an iron fist, overseeing a legion of blue-suited stormtroopers who cracked brown and black skulls at every opportunity. Rodney King, the ’92 riots, and CA governor Pete “Pito” Wilson’s anti-immigrant Prop 187 were all on the bleak horizon. 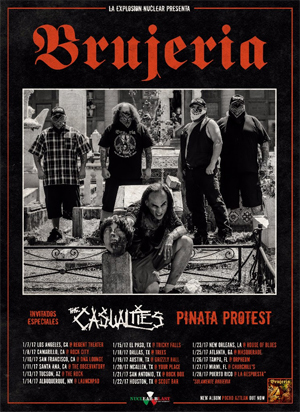 The Mexican-American agitators of BRUJERIA captured the mood of the city’s minorities with the band’s infamous and widely banned 1993 debut, Matando Güeros (“Killing White People”), quickly becoming the Spanish-language counterparts to early grindcore masters TERRORIZER and NAPALM DEATH. Led by lyricist and mastermind Juan Brujo, BRUJERIA were alternately rumored to be satanic drug lords and members of well-established metal bands. The truth, as always, lay somewhere in between.